…Believing that the ideological similarities between the two movements – their contempt for liberalism, their common volkish racism and, of course, their mutual conviction that Germany could never be the homeland of its Jews – could induce the Nazis to support them, the ZVfD solicited the patronage of Adolf Hitler, not once but repeatedly, after 1933. Everyone in Germany knew that only the Zionists could responsibly represent the Jews in dealings with the Nazi government. We all felt sure that one day the government would arrange a round table conference with the Jews, at which – after the riots and atrocities of the revolution had passed – the new status of German Jewry could be considered. The government announced very solemnly that there was no country in the world which tried to solve the Jewish problem as seriously as did Germany. Solution of the Jewish question? It was our Zionist dream! We never denied the existence of the Jewish question! Dissimilation? It was our own appeal! … In a statement notable for its pride and dignity, we called for a conference. I was not well versed on matters of saving the Jews of Nazi-occupied Europe, even though I was chairman of the Jewish Agency. The heart of my activity was enlisting Jewry in the demand to establish a Jewish state. If I knew that it was possible to save all the [Jewish] children in Germany by transporting them to England, but only half of them by transporting them to Palestine, I would choose the second – because we face not only the reckoning of those children, but the historical reckoning of the Jewish people. Segev states that the tendency of the Zionists was to see Jewish immigration as the means of establishing the Jewish state rather than as a means of rescuing Jews. 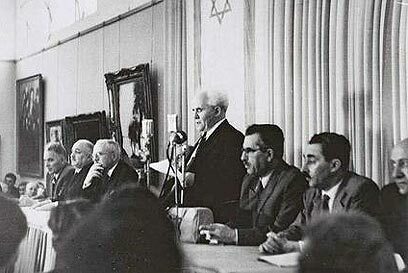 Ben Gurion said that he would prefer young workers rather than old people or children; he wanted the children to be born in Palestine. Hence, during the 1930s most immigration permits were issued to young unmarried male “pioneers.” While a small number of permits were allocated to children, the Jewish Agency stipulated that these should exclude retarded children. In 1936, a special fund was established in Palestine for the RETURN of incurably ill Jews to Europe, because they had become a “burden” on the community and its social institutions. However, Europe’s Jews were not enthusiastic about going to Palestine to establish a Jewish state. Even in Poland there were few takers for permits from the Jewish Agency. Moshe Shertok of the Jewish Agency suggested creating a panic in Poland to encourage Jews to leave for Palestine. Such an attitude would also explain why few Jews were accepted even into the USA even though Roosevelt was surrounded by advisers such as Henry Morgenthau Jnr., Bernard Baruch, and Felix Frankfurter. Zionists have continued to foster and exaggerate anti-Semitism, and this has included the manufacturing of “false flag incidents.” The following account by Zionist veteran Naeim Giladi should become widely known. It is a complete expose of the Zionist modus operandi in regards to anti-Semitism. A particularly significant event was the creation of fake anti-Semitic incidents in Iraq to push Iraqi Jews into emigrating to Palestine. This was exposed by a former Israeli agent and Iraqi Jew Naeim Giladi, who had played a role in the operation, author of Ben Gurion’s Scandals: How the Haganah & the Mossad Eliminated Jews. Giladi’s article “The Jews of Iraq” provides a synopsis of the operations that the reader is urged to peruse in full online, from which I quote. Although Jews, like other minorities in what became Iraq, experienced periods of oppression and discrimination depending on the rulers of the period, their general trajectory over two and one-half millennia was upward. Under the late Ottoman rule, for example, Jewish social and religious institutions, schools, and medical facilities flourished without outside interference, and Jews were prominent in government and business. About 125,000 Jews left Iraq for Israel in the late 1940s and into 1952, most because they had been lied to and put into a panic by what I came to learn were Zionist bombs. With the declaration of the Zionist State in 1948, an Iraqi detachment were among the Arabs who fought against the Zionist interlopers.